You can select multiple nodes at once using a box select by left clicking and dragging. 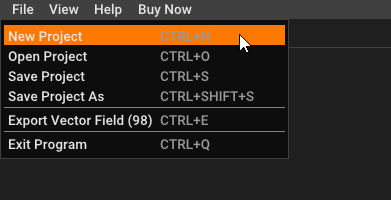 Holding CTRL appends to the current selection. Clicking selected nodes and dragging will move all selected nodes (and connections) at once. Right-clicking a group of selected nodes will give you the option to delete them or save them as a preset. CTRL+C and CTRL+V to copy and paste the selection. 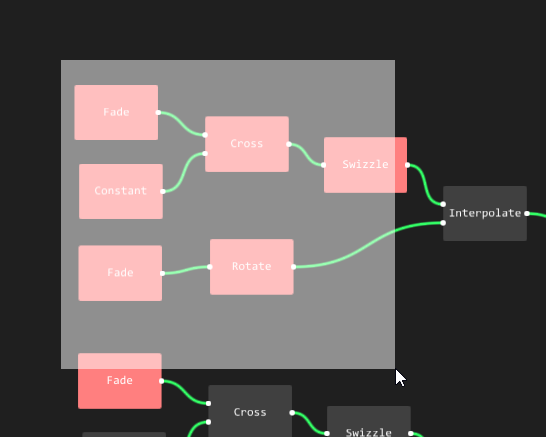 Shift+Left Mouse, or Middle Mouse to pan instead of Left Mouse (because of the box selection) in the Node Graph. Multiple new keybindings are in. New, Open, Save, Exit, etc. 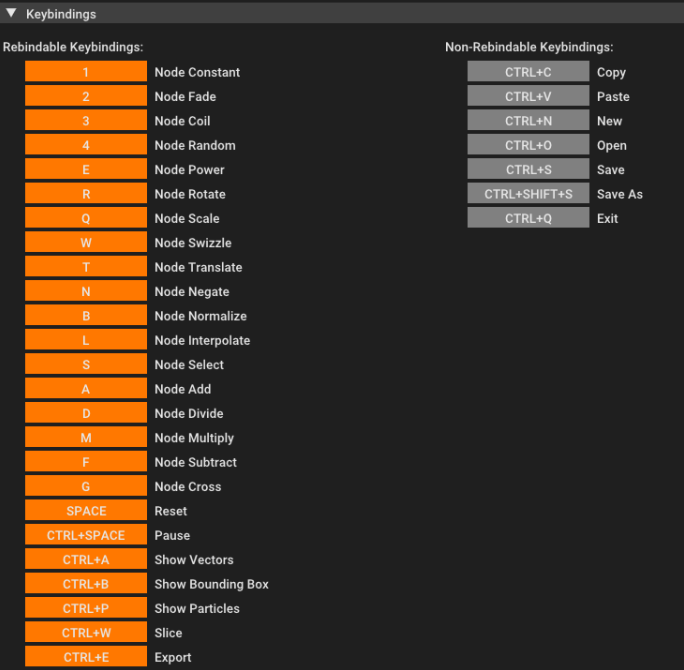 See the Settings panel for a full list of customizable keybindings. Not all bindings are re-bindable, such as copy-paste. Open and Save window dialogs have been added when opening and saving projects, presets and vector fields. When exiting the software you are now prompted with a prompt asking if you want to save your project. Your settings are saved to the `settings.vrg-settings` file in the Vectoraygen folder on exit. The software loads your custom settings from this file on startup. Keybindings are more streamlined and fleshed out. Note, some keybindings are not re-bindable. We have added more Axis options for the cut view mode: XY, XZ, and YZ plane. The bounding box can be translated and rotated freely, though these bounding box orientations are not exported. The particle spawn location can be detached from the bounding box as you move and rotate it around. A new viewport has been introduced with a simple floor and lighting. All settings for this are adjustable. `.vrg-preset` files in the presets are automatically scanned when running the software and show up on the right-click menu under the "presets" submenu. Presets can be saved by selecting a group of nodes, right-clicking on one of these selected nodes, and clicking "Save Selection As Preset". Your current session is saved to the `current-project.vrg` file in the Vectoraygen folder when exiting the software. The software loads the node graph and settings from this file on startup. Note: Misc and Keybindings are not stored in the project file, but Bounding Box, Vectors and Particle settings are. The current project opened is indicated in the title bar. If no project is opened (the default), an asterisk (*) is shown instead. A new project can be started from the File Menu by clicking "New Project". This will reset the node graph, and reset bounding box, vectors and particle settings to their default values. 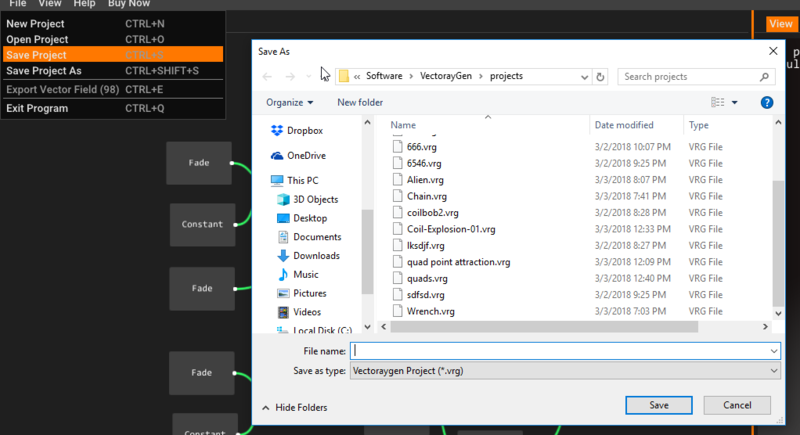 Projects can be opened and saved through the File Menu. We recommend putting all projects in the projects folder by default, though it isn't necessary. If you want to export a vector field, you now must go to File > "Export Vector Field" or by pressing CTRL + E.
The coordinate system option has been moved to Misc settings. You can exit the program from the file menu. We now provide an installer. Certain nodes, and particle spawn locations, now have indicators to help you visualize how the field is influenced by the field. The Tutorials tab has been removed. Please check the help menu instead. The Export tab has been removed. Please use the file menu instead. You cannot copy and paste externally anymore. Share preset files with your friends/co-workers instead. Scripts are gone, use presets instead. The Log panel is gone. Relevant output is printed to the log.txt file in the Vectoraygen folder instead.